The new THINWALL® aggregates trailer features a narrower body with lower sidewalls which, along with Titan’s patented aluminum body construction, achieves significant reductions in tare weight compared to similarly sized belt-out trailers. 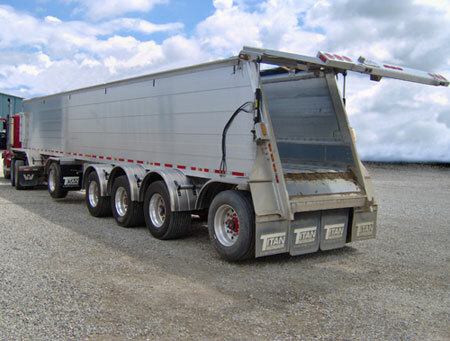 The THINWALL body features the same double-walled, doubled-welded construction renowned for outstanding durability in extreme hauling applications such as CD waste and scrap metal. The trailer’s 102” frame mounts a narrow 68” wide body which reduces the overall weight while providing aggregate haulers with ample room to load maximum weights. The narrow smoothsided body also streamlines the trailer for further fuel savings, a lower centre of gravity and improved tracking on the road. Inside is the latest 6-slat V-Floor® self-unloader from KEITH Mfg. Co. The new KEITH® V-Floor system provides the level unloading capability preferred on today’s worksites, without the extra weight, height and maintenance demands of belt conveyors. Titan has enhanced the system with an integral V-Plow self-cleaning system. With no subframe required, the V-Floor unloader allows the Titan trailer to maintain a lower sidewall profile which reduces wind resistance and allows loading with smaller equipment. According to Mike Kloepfer, President of Titan Trailers, the customized V-Floor trailer offers aggregate haulers the opportunity to earn more profit on every load with larger payloads, lower fuel costs and with reduced costs for maintenance and routine service. The solid level deck of the V-Floor system also expands the range of contracts that truckers can take on as backhauls or in the off-season for construction projects. The V-Floor unloader is able to load commodities as varied as palletized goods, agricultural chemicals and even hot asphalt. Standard equipment includes a hydraulically powered tailgate, disc brakes and a handheld remote control for operating the WALKING FLOOR®, V-Plow, tarp and tailgate.